"We have turned to C. Michael Ferraro many times over the years to facilitate a wide variety of programs that promote individual and team growth. Most recently, we engaged Michael to facilitate the Five Behaviors program, and we were very pleased with the results. Michael was able to draw on his experience facilitating this program with other companies and apply his insights about our company culture to create a customized approach based on our specific needs. We noticed subtle changes in the way team members interacted with each other almost immediately, and over the course of the program we saw real improvement in the overall team dynamic. Our investment in the Five Behaviors program gave us the tools we need to maintain and improve our team interactions which in turn will drive team success and business growth." 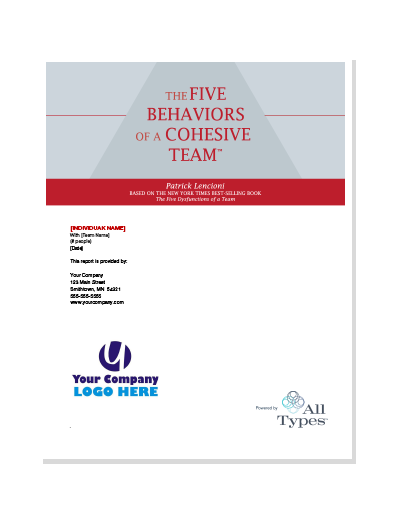 Based on the work and the book by Patrick Lencioni, The Five Behaviors of a Cohesive Team assessment and accompanying material is designed for an intact team. Before choosing this program, consider the questions: Is the team really a TEAM? A team is a relatively small number of people (from three to twelve) who meet on a regular basis and are collectively responsible for results. The team members share common goals as well as the rewards and responsibilities for achieving them. Not every group is a team. For example, a group that appears to be a team might simply be a collection of people who report to the same manager, but who have relatively little interdependence and mutual accountability. If a group does not meet the criteria of a true team, this process is unlikely to produce the results they expect. This program is powered by All Types based on Carl Jung's theory of psychological types, like the MBTI® instrument, as their preferred indicator of behaviors and personality.